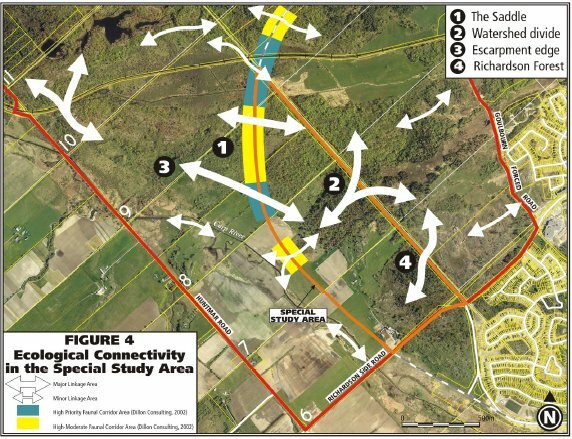 Study Area (SSA) on Schedule B of the City of Ottawa Official Plan (Ottawa OP) (Figure 1). context of the South March Highlands. unnecessary, given the existing detailed in-house knowledge of the site and its surroundings. reviewed and confirmed in the field in June 2004 (Appendix 3). necessary to evaluate it within the context of its larger natural unit, the South March Highlands. by the province and the municipality in these policy documents. vegetation types (Bakowski 1996; Geomatics International 1995, respectively). degraded condition) within the NEA. Stage 1, Regional information base and ecological profile. 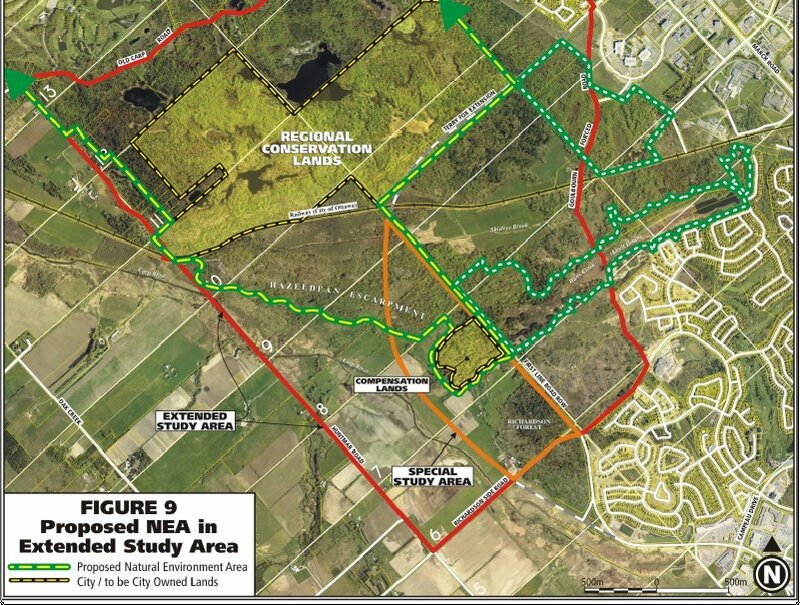 (Geomatics International Inc.
• Kanata Lakes Natural Environment Area Implementation Plan (Draft) (CH2MHILL. • Carp River Watershed/ Subwatershed Report (Draft) (Robinson Consultants 2003). this report for reference purposes (Appendix 1). definable under terms of the PPS (Ontario 1997). allowed for some additional natural environment features and function documentation (e.g. changes which had occurred since the 2000 field season thereafter. undeveloped, constituting one of the largest areas of continuous natural landscape in the City. habitats (Brunton 1992a; 1992b; 1997). additional 20 ha of adjacent natural landscape in 2002. ROW providing the only physical interruption crossing the length of the SSA. element of the latter area’s overall significance and conservation value. the ecological features and values of the SSA. Special Features criteria for NEA identification and delineation. habitats) remain significant within the City of Ottawa as local indicators of ecological value. and Uncommon) species are noted with the appropriate entries in Appendix 2.
very locally distributed in Ottawa (Brunton, in prep.). for NEA identification and delineation. for ecological recruitment and renewal within habitats. ROW between SSA Lot 6 and the upland/ lowland complex south of Watts Creek. being identified from the faunal data in Dillon Consulting (2003). criteria for NEA identification and delineation. ecological integrity of areas similar habitats. philadelphicum) (Brunton 1992a; 1992b; 2000). examined in the on-going Urban Natural Areas study (pers. obs.). outcrop barrens are particularly notable in this regard. 5 indicates the approximate position of the large areas of interior forest in and about the SSA. sustainability of natural values in the SSA. short-term and long-term conservation purposes. Provincially Significant Wetlands in the City of Ottawa (Ottawa 2003a). forest clearing in parts of the KNL lands, is a Locally Significant, Class 4 Evaluated Wetland. 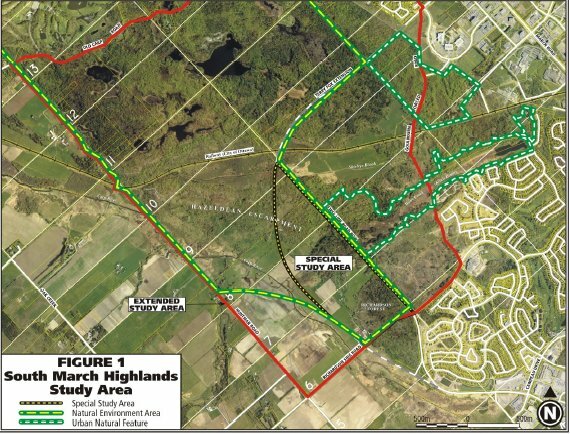 Locally Significant Wetlands is stated as a goal in the City of Ottawa’s Official Plan. study (Brunton 1997), as well as this review (above). 1997), as well as this review (above). existing and future natural environment conditions and human activities, both on and off site. important of these considerations follows. physical barrier to most ecological processes along the edge of adjacent natural habitats. many areas along these trails (pers. obs.). Extent of interior forest: The First Line Road ROW transects continuous natural habitat area. in many places within the ROW and contributes to habitat continuity. vegetation along the eastern side of the SSA. adjacent land use issues affecting the SSA are discussed below. forest in the Richardson Forest portion of the SSA. ecological significance of both the SSA in particular and the South March Highlands in general. 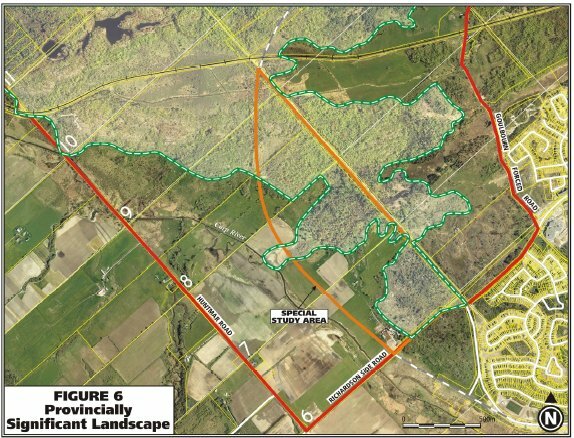 top and face of the Hazeldean Escarpment to the west of the SSA (Figures 2, 3, 4 and 5). lands involved, however, it is difficult to quantify the loss of particular natural features. ROW to partially mitigate these loses. either alternative will inevitably have some impact. least reduce the losses of significant ecological value here. sustainability in light of the on-going development of adjacent lands. 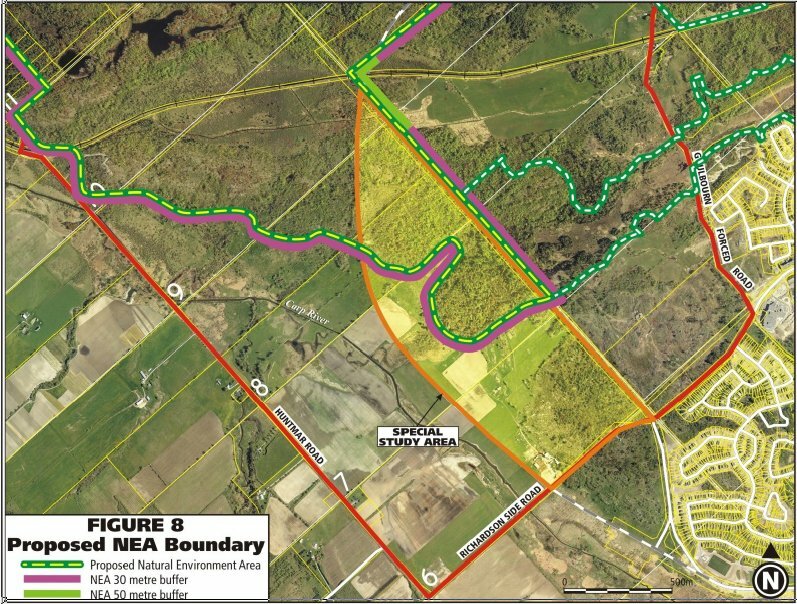 The SSA NEA boundary proposed as a result of this investigation is illustrated in Figure 8.
boundary in the larger Extended Study Area has not been field checked beyond the SSA. (2002a; 2003) (see also 4.8.2, above). be addressed at the site plan level of subdivision design. enhancements, etc.) (see 5.3, below). - area is entirely committed to urban scale residential development. 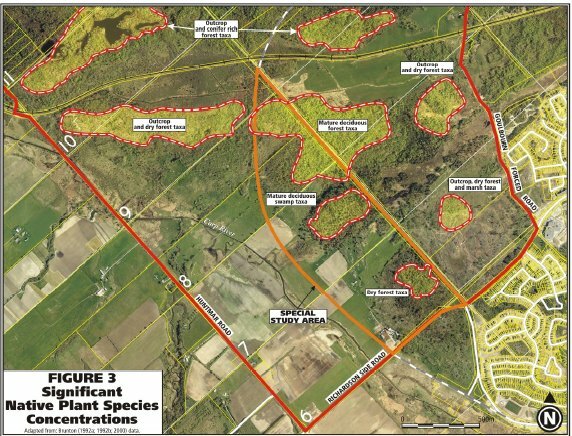 - Provincially and Locally Significant Wetland components. benefit of including PSW habitat. and retained NEA lands (see 5.2, below). that direction is provided by the City of Ottawa OP (Ottawa 2003a). whether development may have an impact on significant wildlife [and woodland] habitat". and loam based lowlands which dominate eastern Ontario (Chapman and Putnam 1984). significant features and functions for which the NEA or Urban Natural Feature was identified. however, at the site plan level of subdivision design. Brunton, D. F. 1992b. South March Highlands Study Area: Natural Environment Assessment. Ministry of Natural Resources, Kemptville. Edition). Ontario Geological Survey Special Volume 2, Toronto. [Unpublished draft report for City of Ottawa]. CH2MHill, Ottawa. for KNL Developments Inc.], Cummings Cockburn Ltd., Ottawa. report for Region of Ottawa-Carleton], Dillon Consulting Ltd., Gloucester. Kanata], Dillon Consulting Ltd., Ottawa. (First Draft) [Unpublished report for the City of Ottawa], Dillon Consulting Ltd., Ottawa. 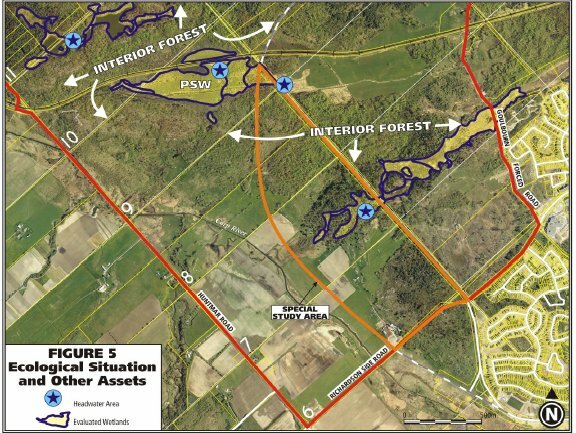 Municipality of Ottawa-Carleton: Stage 1, Regional information base and ecological profile. Planning and Property Department Report 28-02, Region of Ottawa-Carleton, Ottawa. of Biotic Diversity. University of Chicago Press, Chicago. mitigation (Unpublished report for the City of Ottawa), ESG International Inc., Ottawa. features, 8 November 2002, in lit. to E. Balys & Associates Inc., ESG International Inc., Ottawa. October 2002, in lit. to S. Cunliffe, City of Ottawa, Ottawa. system for southern Ontario. Natural Heritage Information Centre, Peterborough. Ontario. 1994. Ontario wetland evaluation system, Southern Manual (3rd Edition - revised). Ontario Ministry of Natural Resources, Toronto. Ottawa. 2003a. City of Ottawa Official Plan. Publication 1-28, City of Ottawa, Ottawa. Approvals Branch Report 28-08, Region of Ottawa-Carleton, Ottawa. consolidation - April 1999. Report 6-58, Region of Ottawa-Carleton, Ottawa. Riley, J. L. & P. Mohr. 1994. The natural heritage of southern Ontario's natural landscapes. Ontario Ministry of Natural Resources, Aurora. Robinson Consultants Inc. 2003. 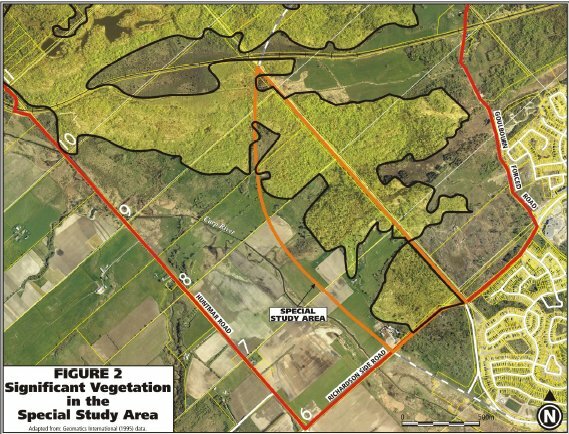 Carp River Watershed/ Subwatershed Study Report (Draft). (Unpublished report for the City of Ottawa), Robinson Consultants, Ottawa. White, D. J. , E. Haber & C. J. Keddy. 1993. Invasive plants of natural habitats in Canada. Canadian Wildlife Service, Environment Canada, Ottawa. wide variety of Regionally uncommon to rare natural environment features and values (Brunton 1997). the route 4-1 and the existing urban boundary (First Line Road allowance). change significantly given the Terry Fox Drive Extension Alignment 4-1 ? added importance given the Terry Fox Drive extension ? 1992b), and new field investigations were undertaken. information base on the area. Woods, Natural Environment Area (B)).
. approaches in associated lands during and after construction. noted below) were documented to assist in the resolution of outstanding planning issues. (west), General Urban (east) and NEA (A) (northeast) lands (Region of Ottawa-Carleton 1999). area is forested, although a substantial area of agricultural land (pasture) occurs in the southern portion. wetlands across the Region of Ottawa-Carleton in the late 1990s. woodland edges (Appendix 1) but severely limited natural floristic diversity. Ottawa-Carleton (cf. the preliminary lists of Brownell & Larson 1997) are also listed below. Carleton, previous breeding-season reports also being from the Carp Ridge area. frequency, these being the common Green Frog and Wood Frog. Blanding's Turtles all being observed there on different occasions. the Region of Ottawa-Carleton 1997; Brunton 1997). extensive complex of common and rare habitats demonstrating a high degree of ecological integrity. development intrudes from the west in some sections. animal species typical of superior examples of the habitats represented here (Brunton 1992b; 1997). regulatory function of the area. habitat in the northern half of the study area contributing the greatest number of these (Brunton 1992b). Golden-winged Warbler noted at the edge of the large thicket swamp at the north end of the study area. makes to each other - particularly to adjacent lands. between such areas is necessary for the movement of plant and animal species between them. the quantity of protected ecological assets, its ecological diversity would remain essentially unchanged. half of the 4-1/ 4-2 study area will be impacted - possibly severely - by fragmentation and edge effect. immediately west of the Second Line Road. habitat south and west of the communications tower south of Richardson Side Road. 2) increased fragmentation of the habitat. which may degrade native biodiversity in adjacent forested areas. Department Report 28-07, Regional Municipality of Ottawa-Carleton, Ottawa. for City of Kanata, Kanata], Daniel Brunton Consulting Services, Ottawa. Branch, Region of Ottawa-Carleton], Daniel Brunton Consulting Services, Ottawa. Ontario. University of Waterloo Press, Waterloo. and Property Department Report 28-02, Regional Municipality of Ottawa-Carleton, Ottawa. Lee, H., W. Bakowsky, J. Riley, J. Bowes, M. Puddister, P. Uhlig and S. McMurry. 1998. Guide FG-02, Ontario Ministry of Natural Resource, North Bay. 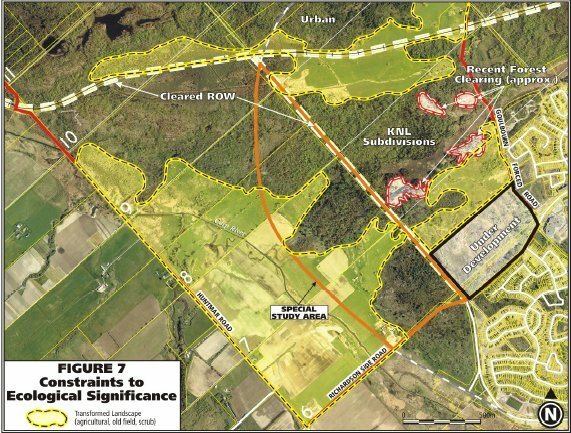 Approvals Branch Report 28-08, Regional Municipality of Ottawa-Carleton, Ottawa. consolidation - April 1999. Report 6-58, Regional Municipality of Ottawa-Carleton, Ottawa. Possible breeding: • species observed in its breeding season in suitable nesting habitat. Probable breeding: • pair observed in suitable nesting habitat in breeding season. • courtship display, including copulation or courtship feeding. • visiting probable nest site. • agitated behaviour of an adult. • nest building or excavation of a nest hole. Confirmed breeding: • distraction display or injury feigning. • used nest or egg shells found. • recently fledged or downy young found. • adults carrying faecal sacs or food for young. • adults leaving or entering apparently occupied nests. • nest with young or eggs found. in bold and CAPITALS. If such species were noted in the study area but not as breeding species (e.g. discussion of their status occurs. Eastern Wood Pewee . . Least Flycatcher . . .
Black-capped Chickadee . . . .
American Robin . . . .
Song Sparrow . . .
Red-winged Blackbird * . .
Brown-headed Cowbird . . .
Larson 1997) denoted with bold and CAPITALS. study area searched 29 May. American Toad rare - one noted at wetland edge. Bullfrog rare - two observed in Blanding's Turtle pond (see below). habitat in the northern portion of the 4-1/ 4-2 study area. Leopard Frog rarely observed along wetland edges in later summer. Painted Turtle observed rare in woodland pools along the First line Road allowance. Snowshoe Hare droppings noted regularly throughout woodlands. Meadow Vole tunnels observed in open meadows. Eastern Chipmunk common in woodlands. Woodchuck burrows encountered in open areas and along woodland edges. Beaver active dams maintained along several drainage channels. Striped Skunk tracks noted along wetland edges. Porcupine animals or evidence of feeding noted rarely. Red Fox tracks observed near Richardson Side Road. in and about the study area (fide L. Richardson). herbarium of D. F. Brunton. lit.). The Co-efficient of Conservation rating for each species is taken from Oldham et al. (1995). Ageratina altissima (L.) King & Robins. Brachyelytrum erectum (Schreb. ex Sprengel) Beauv. Caulophyllum giganteum (Farw.) Loc. & Black. Eleocharis palustris (L.) R.& S.
SW; South Gloucester; DND Woods. South Gloucester, South March Highlands. South March Highlands (3+ populations). commencing immediately east of Haunted House outcrop.